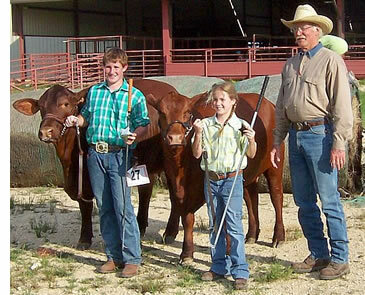 Believing that the future of our breed rests in the capable hands of Santa Gertrudis Junior members, in 2003 Bill added another feature to the annual sale event—a drive-up junior heifer show. Each year, $3,000 in scholarship funds are made available to the highest placing eligible heifers in the junior, yearling and senior divisions of the Five Oaks show. To be eligible to win scholarship money, a heifer must either be purchased from Five Oaks or Five B Ranch or carry those genetics in the first generation of the heifer’s pedigree. To date, $13,000 has been paid to junior showmen entering their first year of college and funds are still banked in the amount of $8,000 at this time, awaiting further high-school graduations of junior showmen who have qualified for scholarships. Bill and Kati are ever so grateful to Jane and Suzanne Fulton who served as bookkeepers for the show each year. Due to the ongoing drought in Texas, Five Oaks Ranch was forced to reduce their herd numbers and discontinue the annual production sale. With an optimistic hope for the future, Bill Barrett will consider another production sale when cattle numbers and weather conditions make it possible.